briefing > President’s performance, citizenship, land ownership and the TRC’s mandates: What do Liberians say? 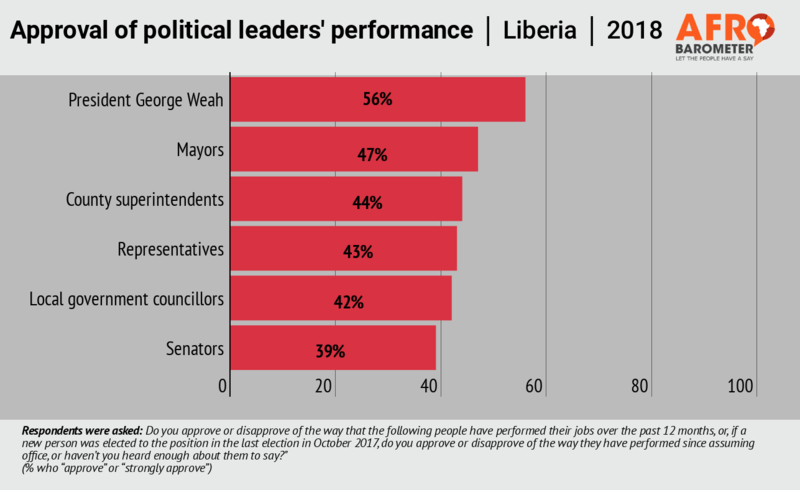 Performance of President Weah: 56% of Liberians approve of His Excellency President George Weah’s job performance since he assumed office in January 2018. Citizenship: 68% of Liberians want the exclusive black citizenship law to be maintained. The same proportion say only Liberian citizens should be allowed to own land. Truth and Reconciliation Commission’s recommendations: Six in 10 Liberians (58%) say they are “fairly satisfied” or “very satisfied” with government’s efforts at implementing the TRC’s recommendations. Most important problems: The most important problems that Liberians want government to address are rates and taxes (55%), food shortage/famine (38%), and infrastructure/roads (38%).